Another dry bright morning, but the wind from the north is still with us, cooling things down. Down to Bank Newton top lock by 11:30, waiting for George and Christine, who arrived about 12:00. A couple of hours for lunch, catching up on the news and giving Mags her birthday present (arrived at George’s the day before) and we decided to shove off down the locks. 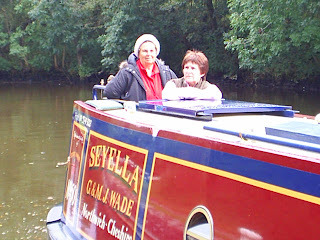 Our visitors stayed with us, George helping me with the locks, and Christine keeping Mags company. We parted company at the bottom of Bank Newton, they headed for home while we headed for Gargrave. Nearly stopped for the night at the Aire aqueduct, but decided to press on down the 3 locks into the village. Arrived and moored up by 16:00. We’ll be here now till Tuesday, when we intend to start our journey south. I’ve got a hire car booked for Friday till Monday, that will take us up to Newcastle Upon Tyne for the Great North Run on Sunday. We’re expecting to see some of our northerly based family and friends there, too. As the forecast predicted, it was very windy Sunday and Monday. In fact, one gust was strong enough to blow the steel chimney cap of the roof and into the cut! Not many boats moving, either. Can’t really blame them. I rang Low Park Marina at Barlick yesterday to see if they’d had a delivery of solid fuel, and set off this morning at around 10:45 to collect it. A much better day, dry but with a cool breeze from the north. 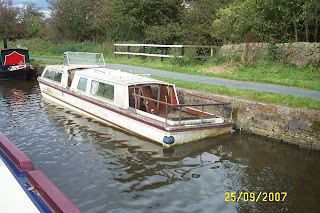 The intention was to make it a 2 day trip, up through Greenberfield and to the marina, turn around and stop overnight, then return on Wednesday. But George rang to say they were coming over to see us Wednesday lunchtime, so we need to be back near Bank Newton by then. We decided to return to the “wigglies” today, leaving just a 20 minute cruise to the top of the locks tomorrow. 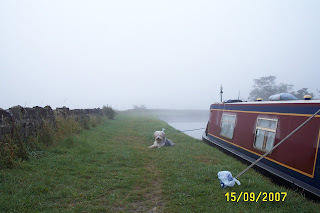 So we turned near the Anchor Inn at Salterforth (didn’t stop for a pint this time), back past the permanent moorings and the marina, and retraced our route back to the mooring. 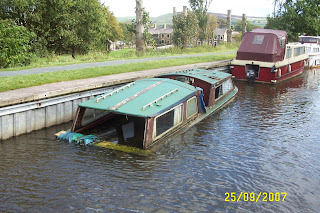 Derelicts on the Salterforth Permit Holders moorings. While I was mooching around in the chandlery at the marina, I spotted this and couldn’t resist it. 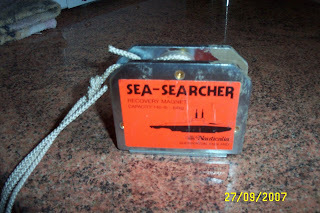 I recovered the chimney cap with it in a few minutes when we got back to the mooring. I’m sure it’ll come in useful in the future, as well. Got back around 6 o’clock, after what seemed to be a long day. We’ve been here at Gargrave since arriving back with Val and John last Monday, and anyway we are running short of water so we need to go up to the service point. 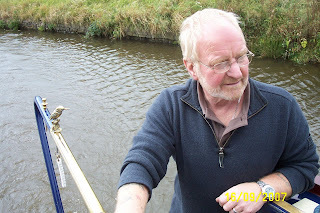 After filling up, we moved back up through the 3 Gargrave locks and the Bank Newton flight, and moored in our usual spot on the “wiggley bits”. 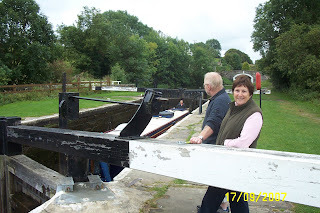 We were accompanied up most of the locks by the local lockies, and I got reprimanded for walking across the lock gates from one side of the chamber to the other. Apparently a “Near Miss” report has to be filled in every time this is witnessed. So I’ll be good (when BW guys are around)! I’m not going to make any comments about Health and Safety Regulations, apart from the view that these rules are being implemented in response to (and fear of) our litigious culture, one of the less desirable imports from our transatlantic cousins. From next year, the same blood/alcohol limits for motor vehicles is to be applied to boat users, despite there being no evidence to support the idea that drink is a major factor in boating accidents. In fact, the few reported drownings due to inebriation are of people returning home or back to their boat along the towpath after a skinful in the pub! It’s been cloudy with sunny spells, and quite warm, though the forecast for the next few days is poor, windy and wet, and colder with a northerly wind. Mags had a quiet birthday yesterday, though she got quite a few cards and phone calls. Her present from me hasn’t arrived yet, though. We collected Val and John as planned, and set off from Gargrave on Friday at around 11:00. Not much to report of our steady run up through the last 3 locks out of Gargrave and the 6 at Bank Newton. The weather was fine and dry, but there was a moderate wind from the NW. On down to the “wiggly bits” again, and a chilly night, but the clear skies gave superb views of the stars, with the Milky Way clearly visible. 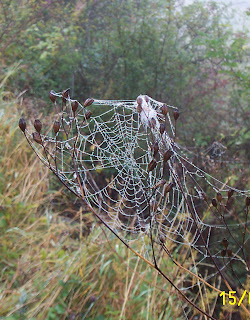 The morning was misty and cool, good for cobweb photos. We set off again towards Barnoldswick. Only the odd boat moving, a lot quieter than expected. Stopped at Low Park Marina for diesel and coal, got the diesel but he only had 1 10Kg bag of smokeless left. That won’t last long if it gets cold! Still, we’ve still got a 25Kg bag on the roof from last spring, so between them they’ll last about a week. Val came out of the marina shop sporting a fishing net (you know, the kind used by kids for minnows), and a new ball for Meg. The net was apparently for fishing balls out of the cut, but she had an ULTERIOR MOTIVE. We’d passed a few back gardens in Barlick containing apple trees with a lot of ripe fruit. Her idea was to swing the boat in to the side on the way back and “scrump” the apples with the net! After the boatyard we travelled another mile or so before winding just past the Anchor at Saltersford. This is the pub built on top of the old one when the canal was cut, and has stalactites in the cellar! The original structure dates back to 1655. Just before the pub the bank of the canal was filled with blackberries, so we mooched in to the side and helped ourselves from the boat. We soon had a big bowl full. (To go with the apples….). After a pint in the pub we moved back up to just past the boatyard again and stopped for the night. We had a blackberry crumble for pudding as I was still trying to sway Val from her larcenous plans. 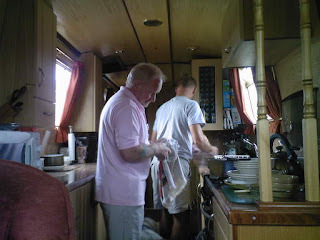 Where did all the washing up come from.....? Sunday morning was dry and bright and we got off at around 10:30. Into Barlick and we unfortunately just happened to pass the target garden without stopping. Just as well, as the lady of the house was watching out of her kitchen window! Phew, no civil action to worry about, then! Arrived back at the wiggly bits early afternoon. We’d had a call from Mark and Melanie, saying they were on the way, and they arrived just before the rain set in. 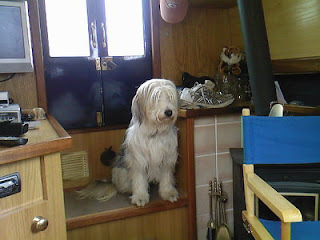 It got a little cramped on board, with Mark and Melanie, their 3 girls and Bess the labrador, as well as us and Val and John. Still we found seats for everyone, and I had a (very noisy!) game of Frustration with Jo and Laura (Laura won). By the time they set off back down the towpath the rain had settled in and they faced a wet 15 minute walk back to the car. In the morning we set off back to Gargrave, threatening weather just giving us the occasional light shower. We had a very quick run down Bank Newton locks, with 2 duty lockies setting the locks for us. Back into the village at 13:00, and said goodbye to V and J.
We’ve had a very enjoyable few days, good company, good food, reasonable weather, although a rather rough white wine needed a drop of lemonade to make it more palatable. Still, the red was good, as was the malt whisky! Meg enjoyed the company too. It gave her the choice of 2 beds to jump on in the morning! Back to ourselves for a few days now I guess. The weather was cold last night, so I lit the fire, but the forecast is for warmer, but wet and windy conditions later in the week. Just a quick update. We’re still at Gargrave, as planned. Mags has had her “MOT” and has been pronounced mechanically sound for another 12 months. In fact, the doctor said she’d never looked so well! Must be all the fresh air and running up and down locksides! We’ve been visiting family and friends over in Ingleton, and been visited here as well. Picked up a car from Enterprise last Friday, and went to Howard’s going away do on Saturday. He left for his new home in Eire last night. It was busy, and Mags had a chance to catch up with people we hadn’t seen since leaving last August. Then on Sunday we went down to Sheffield for the inaugural Great Yorkshire Run. I’d always intended to run a sub 45 minute 10k, and was disappointed to finish in 45:02 in Manchester in May. So I’d been training hard for this race. I had a good start and a reasonable middle, but the pace and the inclines took their toll and I struggled at the end. Crossed the line with gritted teeth in 44:43, but it felt harder than Manchester. Pleased, though. Placed 317th out of 4500, but I don’t think that qualifies me for Beijing. The organisation was excellent, as expected from the organisers of the Great North Run and the rest of the Great Run series. They say they will certainly do it again next year. I’m sure the entry will be a lot higher as well, maybe finally rivalling the 20,000 or so at Manchester. Went to our old friends Val and Johnny for lunch on Monday, and we are having them for a cruise down to Foulridge and back at the weekend. The weather looks promising, so it should be a good few days. I’ll knock off the training for the duration, so we can open a bottle (or 2)! The rental car went back today, but it’s been useful. I mentioned earlier that I was keeping an eye on a suspect battery; well it was sick, dropping down to 10 volts when disconnected from the main bank. So I used the car to get a replacement, and to environmentally (at Settle recycling site) dispose of the old one. So that’s it for the time being. Oh, I’ve run some wires down the back of the cabin linings, connected to a switch and the overhead lights, so Mags can turn on the lights without leaving her seat. The problem is, all the light switches run down the centre of the ceiling, and she couldn’t reach them, even on tiptoe. We’re staying near Gargrave till the end of the month, and will use another hire car from Keighley to get to the Great North Run on the 30th. Back to Gargrave today. We’re now on long-life milk, and Mags has had to bake an “emergency” loaf of bread, without yeast. A bit solid, but not so bad. And the loos are about full, the water tank getting low. We‘ve had a good few days out in the sticks, and, although the weather hasn’t been particularly helpful, I’ve managed to get the RH side below the gunwhale repainted. 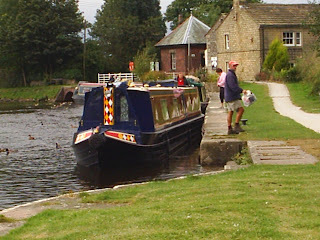 So we got off about eleven, and waited for another boat we saw in the distance when we arrived at Bank Newton. 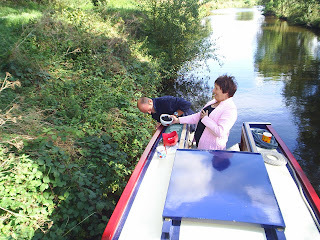 It turned out to be a hire boat from Skipton, but my concerns for the new paint when sharing the locks where unfounded, as they were very careful. We travelled down the 6 Bank Newton locks in company, but separated at the bottom when we stopped for water. Filling here means we don’t have to go right up to the sanitary station in Gargrave, which would necessitate reversing back down the canal to a mooring. The rubbish and toilet cassettes I can carry. The last 3 locks back down into the village where done solo, with the lock-keeper helping out with the last one. We arrived at around 14:30, and had a little trouble finding enough water to moor. It would have been better on the official 3 day mooring further along, but we will be staying longer than that. The pounds all the way down through Gargrave are low, the bottom one down by about a foot. I don’t know what the situation would have been like if we hadn’t had all that rain in June/July. Stopping here for a week or so, Mags has her appointments at the Docs, and I need to get a car to get to Sheffield on Sunday for the 10K I’ve been training for.